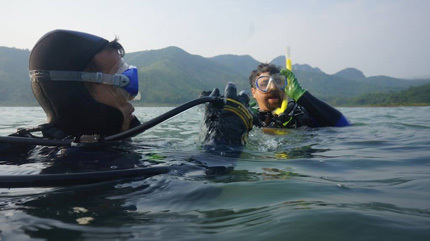 SCUBA diving at Van Don (Quan Lan island) in 2013 (photo by Ian McCann courtesy of the Bach Dang River and Van Don Research Team). Six fieldwork research and training seasons (2008-2013) have been conducted in Vietnam by an interdisciplinary, international team of researchers, research associates, students and trainers that includes specialists in archaeology, surveying, geophysical research, palaeo-landscape and memory studies from the USA, Australia, Canada, Japan and Vietnam. The team has been working cooperatively and collaboratively with the Institute of Archaeology (IA) at the Vietnamese Academy of Social Sciences (VASS), as well as universities, NGOs, national, provincial and district government organisations and individuals, to research, interpret and raise awareness about maritime and underwater archaeological sites and artefacts in Vietnam. The new Underwater Archaeology Department of the Institute of Archaeology (In Vietnamese: Phòng Khảo cổ học Dưới nước) formally started operations on the 1st July, 2013, with the Decision No. 141/QĐ-KCH, dated the 25th June, 2013 which nominated Dr. Le Thi Lien as Head of the Underwater Archaeology Department. 4) In collaboration with the Journal “Khao co hoc” for the publication of papers on underwater archaeology. 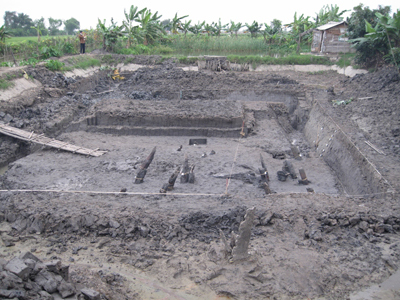 Excavation at Dong Ma Ngua in 2010 (photo by Nguyen Thi Mai Huong courtesy of the Bach Dang River and Van Don Research Team). This website is designed to help increase awareness at local, provincial, national and international levels about the extent and nature of Vietnam’s underwater and maritime cultural heritage. Some of this is based on on-going research projects, some are cultural heritage management activities and some are about awareness raising and capacity building (training). We hope to present material from individual researchers, research teams and government agencies about a range of maritime archaeology projects as well as maritime and underwater cultural heritage investigations that are being conducted in Vietnam today.